EAST RUTHERFORD, N.J. (AP) — After five straight weeks of preparing and coming up empty, the New York Giants have something to smile about starting off a week. It’s amazing what a win can do for a team. “Anytime you win, it kind of verifies that what you’re doing is right,” coach Pat Shurmur said Tuesday, less than 24 hours after the Giants (2-7) rallied late to snap a five-game losing streak with a 27-23 win over the San Francisco 49ers. “The reason we all started playing and coaching football is because we love the competition, we love the physical nature of the game, and we love the process of getting ready to play the next opponent,” Shurmur added. The goal now for the Giants is to try to put a couple of wins together. They haven’t done that since December 2016. They have a 5-20 record in their past 25 games. 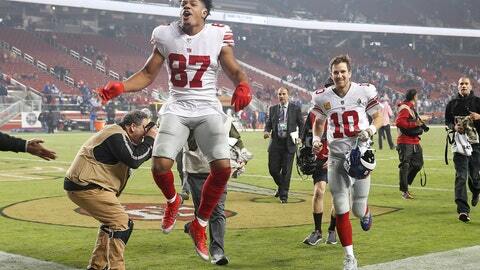 The difference Monday night against the 49ers was the Giants made plays. Eli Manning threw three touchdowns and engineered a late drive capped by a short touchdown pass to Sterling Shepard. The offensive line, aided by the addition of newcomer Jamon Brown at right guard, allowed only one sack and the defense got two interceptions from linebacker B.J. Goodson. Special teams also contributed as Aldrick Rosas kicked two field goals and Corey Coleman had three kickoff returns for 92 yards. The performance by Manning was excellent. There have been many calling for the 37-year-old to be benched with the team losing again. The two-time Super Bowl MVP answered the critics. The Giants will play host to the Buccaneers in their bid for their first win of the season at home (0-4). While the Giants’ chances of making the playoffs remain dim, Shurmur likes the team that has been assembled in his first season.